Do I need to have my lipoma removed? 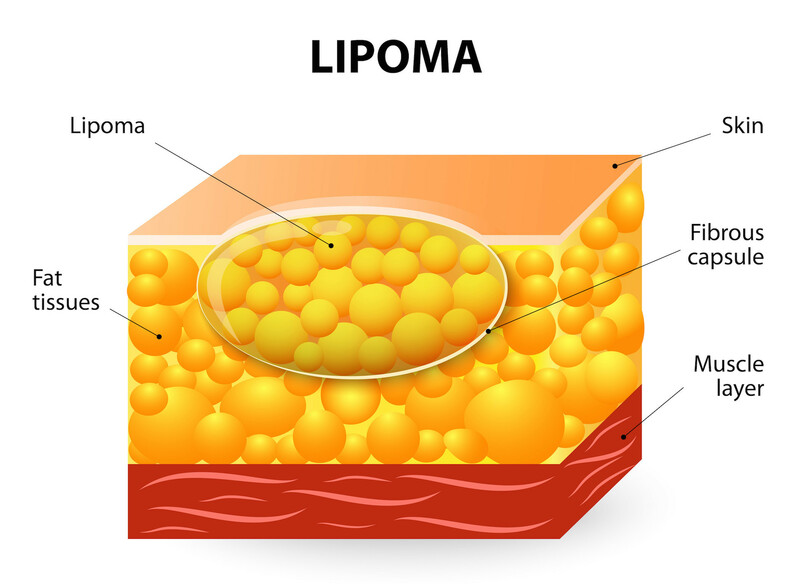 Lipomas are among the most common lumps on the human body. Although lipomas might be responsible for the short term worries of some, they are often benign. While surgical removal is the most common lipoma treatment, other options do exist. Lipomas most frequently develop on people over the age of 30. Lipomas are generally painless. When lipomas form on certain parts of the body, such as near joints, they can cause a level of discomfort, and even impede mobility. There are no known reasons why lipomas form, yet certain factors appear to contribute to their occurrence. Minor injuries to soft tissues may encourage the formation of lipomas. Genetics influence the formation of these “fatty tumors,” as children born to parents with the growths have a higher chance of developing one or multiple lipomas themselves. History and physical exam are the first means of diagnosing suspected lipomas. Any soft, compressible, mobile, nontender, nonpainful, slow-growing, subcutaneous mass has a high likelihood of being a lipoma. MRI or CT scan may be indicated in some cases to assess for tissue characteristics to help confirm the diagnosis. However, these examinations are not definitive as it has been shown that even experienced radiologists cannot distinguish between a benign lipoma and a malignant mass over 30% of the time. Tissue biopsy with laboratory examination is the only modality that can definitively diagnose a mass as a lipoma, and should always be considered when a suspected mass does not “behave” like a lipoma. While nearly all lipomas are harmless, an extremely rare form of cancer known as liposarcoma can resemble a lipoma. This form of cancer occurs in fat cells, but accounts for a very small minority of suspected lipoma cases. In the 24 years between 1985 and 2009, only 6,370 cases of liposarcoma were reported in England. A key sign to keep in mind when determining if a growth is a lipoma or a more serious lump is whether the lump is movable or feels stuck in place. Lipomas should move, within reason. Another difference is in discomfort – lipomas are generally painless while liposarcomas tend to cause pain and even swelling. As lipomas tend to grow very slowly, rapid growth of a mass suspected of being a lipoma is an indication for early evaluation. Practicality aside, as lumps may occur virtually anywhere on the body, they can cause undesirable cosmetic outcomes. In such cases, patients should seek out a qualified plastic surgeon to ensure the complete removal of the fatty tissue. The removal of small and average sized lipomas is performed under local anesthesia, while the patient is awake. Larger lipomas, and lipomas in hard to access areas of the body, may require sedation or general anesthesia. MRI or CT scan may also be used to assess the size and depth of the suspected lipoma in the preoperative period when surgical removal is planned. “Removing a lipoma is generally an easy process for the patient and the doctor,” says Dr. Bergin. “It’s not a very painful operation and is almost always a day surgery procedure.” The removal process takes between 15 minutes to an hour, depending on the size and location of the lump. “A small incision is made in the skin and the lipoma is simply removed,” remarks Dr. Jennifer T. Haley, a board-certified dermatologist in Scottsdale, Arizona. These incisions can be up to two inches long, and leave very minimal scaring once fully healed. Liposuction is an alternative option to remove a lipoma and offers reduced scaring when compared to surgical removal. After localized anesthetic takes hold, a large gauge syringe is used to suction out the lipoma. This procedure does have an increased chance of leading to the lipoma’s regrowth, as entirely removing the lump can be difficult. Liposuction also does not allow for the same definitive laboratory tissue analysis that can be performed when a lipoma is surgically excised. While surgical removal is the most common lipoma treatment, and the procedure that provides the best long term results, other options do exist. Steroid Injections: Steroid injections can help to shrink smaller lipomas, but since the lump isn’t removed they tend to grow back over time. Certain medical professionals may recommend steroid injection prior to the surgical removal of lipomas in order to shrink the growths, and reduce scaring. Home Remedies: Several topical home remedies for lipomas also claim to offer relief. These range from simple apple cider vinegar to chickweed ointments, though there is little medical evidence to support these solutions. Home remedies for lipomas claim to offer relief. However, there is little medical evidence to support these solutions. Procedure: Lipoma removal with liposuction tends to cost less than surgical excision. Size: Lipomas larger than 4 inches will usually need to be removed in an operating room and may require general anesthesia. Lipomas smaller than 4 inches are usually removed in the doctor’s office. Location: Lipomas located in areas of the body that contain important structures will cost more to remove. Lipoma removal is more expensive in the neck, underarms, hands, feet, over joints and facial areas. Provider’s Specialty and Experience: Some doctors tend to charge more than others based on their experience and training. Dermatologists, plastic and general surgeons are the three types of doctors who most frequently remove lipomas. Dermatologists are much more likely to remove a lipoma in the office than the operating room. Larger, more complex lipomas are usually removed by plastic and general surgeons. Number: If you have a large number of lipomas, they may have to be removed on different dates. This is because there is limit on the amount of local anesthesia that can be administered to a patient at one time. Insurance: Your insurance may or may not cover the cost of removal. If the lipoma is causing pain, functional deficits, or there is a higher suspicion for malignancy due to radiologic characteristics or rapid growth, it is more likely to be covered. Removal for cosmetic reasons is generally not covered by insurance. Lipomas cannot be prevented and they may actually recur. Incomplete removal is more common when removed with liposuction than by direct surgical excision.